Leya is to be married to a man chosen by her father — but this beautiful bride-to-be is possessed by the soul of her dead lover, and only a venerated holy man can hope to exorcise his indomitable spirit. 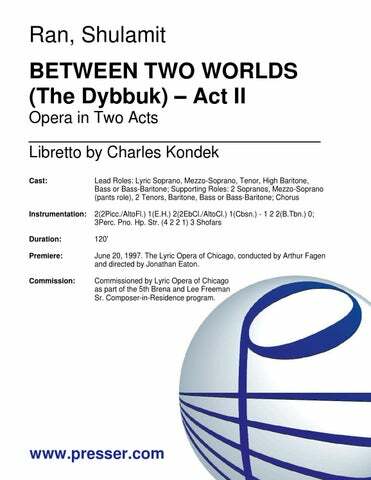 “Between Two Worlds” is based on S. Ansky’s universally admired drama, “The Dybbuk,” which has its roots in the multi-layered folklore of Eastern Europe Jewry. This fabled tale of a love as strong as death — and unyielding as the grave — finds new life in Ran’s extraordinary opera. Commission: Commissioned by Lyric Opera of Chicago as part of the 5th Brena and Lee Freeman Sr. Composer-in-Residence program. The story of China Aster, who borrows money and is unable to pay it back, with disastrous results. Instr: 1(Picc.) 2(E.H.) 3(B.Cl.) 3(Cbsn.) – 4 3 3 1; Timp. 4Perc. Hp. Cel. Str. Mrs. President is an opera about the first woman to run for president of the United States. 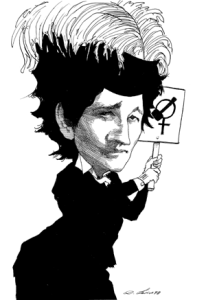 In 1872, Victoria Woodhull ran against Ulysses S. Grant on the Equal Rights Party ticket. Her running mate was Frederick Douglass. Her platform included women’s suffrage and many other much-needed social reforms, but it also included an inflammatory issue which offended America’s puritanical morals: free love. For Victoria, this meant equality between the sexes, but the establishment was threatened by the upending of the status quo. She was branded “Mrs. Satan.” She tried to enlist the support of the most popular preacher of the day, Henry Ward Beecher who, despite his unblemished reputation, regularly seduced his female parishioners. The moniker “Mrs. Satan” came into use after Harper’s Weekly published in February 1872, a cartoon of that title by Thomas Nast which parodied Victoria Woodhull and her beliefs. Instr: 2 2 2 2 – 2 2 1 0; Timp. 2Perc. Hp. Str. Esther was made queen by the Persian king Ahasuerus. When the king’s chief minister planned to kill all the Jews in an act of vengeance against his arch-enemy, Esther revealed to the king that she was Jewish, and pleaded for her people. Her triumph was hard-won: Ahasuerus could not revoke the extermination edict, but instead, allowed the Jews to arm themselves. Their successful defense is commemorated to this day in the annual festival of Purim. Instr: 3(Picc. AltoFl. ), 2(E.H.) 2(B.Cl.) 2 – 4 3 2 1; Timp. Perc. Hp. Str. Premiere: October 8, 1993. New York City Opera, NYC. This entry was posted in Uncategorized on April 28, 2016 by nball.